The Callaway Strata Tour club set is engineered for high performance on every club. 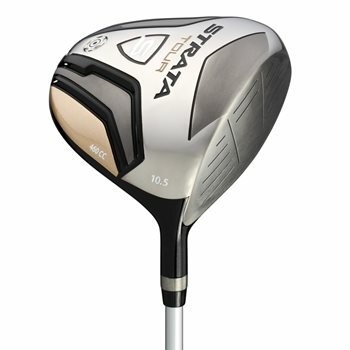 The set features a lightweight 460cc forged driver with a large sweet spot and titanium head designed for distance and forgiveness as well as a forgiving 3-wood with a more aerodynamic head shape for long, high flying shots. The 4 and 5 hybrids are a great alternative to difficult long irons for more confidence on a variety of shots and the stainless steel irons offer forgiveness and control. The mallet putter has a visual alignment aid to help give you incredible accuracy and the lightweight, durable stand bag comes with convenient pockets, cooler pockets, a rain hood and a backpack strap system.